Home » Our Services » What is the SILENT PILER? SILENT PILER uses “press-in piling technology” which is a non-dynamic method for installing continuous preformed piles into the ground. 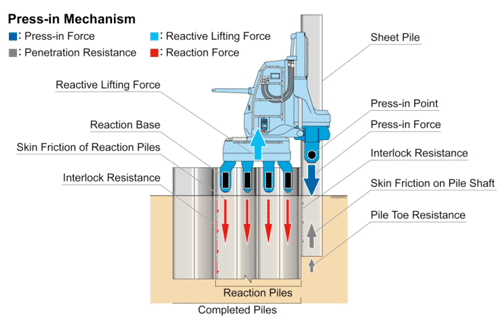 The technique uses hydraulic rams to push piles using a relatively small and compact lightweight press-in machine. This novel installation method has been presented as a ‘silent’ or ‘vibration-free’ piling method. Silent Piler consists of “Main Body”, “Power Pack” and “Radio Control Transmitter”, being operated by a “Qualified Operator”. The Main Body of Silent Piler contains a strong hydraulic cylinder that efficiently drives the sheet pile into the ground and extracts prefabricated sheet pile from the ground while the clamps (part of the Main Body) grip firmly on previously installed piles. The Power Pack has a heavy-duty hydraulic pump that operates on diesel fuel.